Hurricane Florence is causing a State of Emergency to be called in some U.S. States. 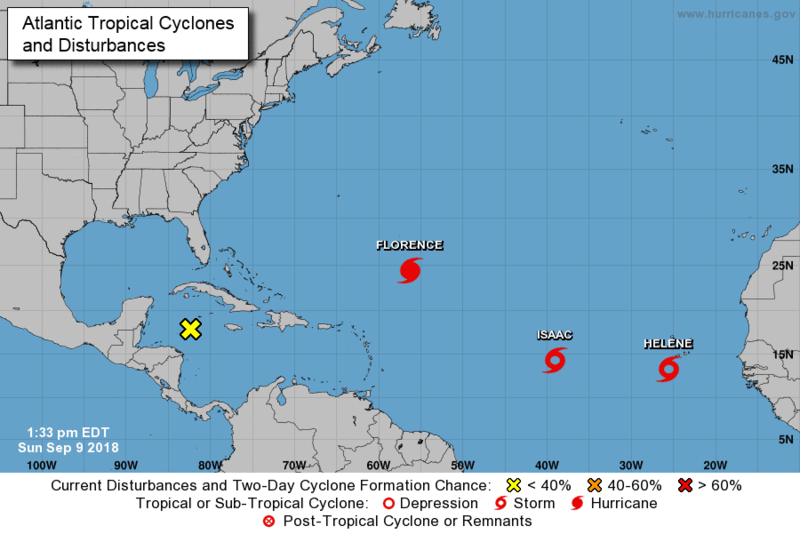 Two new tropical storms have emerged in the eastern Atlantic Ocean and one could threaten some of the Caribbean Islands this week. Climate change is becoming a reality around the world. Hurricane Florence has strengthened back into a hurricane and is forecast to rapidly intensify. It could pose a serious danger for the U.S. East Coast, where a direct strike is increasingly likely by mid- to late-week. “Assume, presume that a major hurricane is going to hit right smack dab in the middle of South Carolina,” said McMaster, urging South Carolinians to prepare for the worst. Eight hundred members of the National Guard have been activated in the state. Hurricane Florence has winds moving at 75 mph, and is 750 miles southeast of Bermuda, moving west at 6 mph. Helene, which is located off the west coast of Africa, has brought tropical-storm-force conditions to the Cabo Verde Islands over the weekend. Farther west, Isaac will track toward the Lesser Antilles this week.